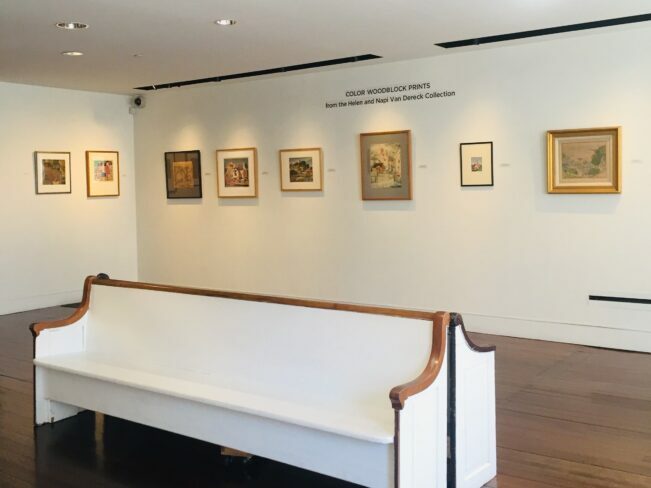 Join PAAM CEO Christine McCarthy and Napi Van Dereck, art collector and owner of Napi’s Restaurant, for a private tour of the exhibition Color Woodblock Prints from the Van Dereck Collection. Parking is available on Commercial and Bradford Streets, and in town-owned and private lots. There are two handicap-accessible parking spots located directly in front of the Museum. See all ArtWeek events here. Presented by Highland Street Foundation and produced by the Boch Center, ArtWeek is an annual award-winning innovative festival featuring more than 500 unique and creative experiences that are hands-on, interactive or offer behind-the-scenes access to artists or the creative process. ArtWeek was born in Boston in 2013 and now serves over 100 towns across Massachusetts as the signature nonprofit community program of the Boch Center. ArtWeek works to spotlight how the creative economy is thriving in Massachusetts by offering unique and affordable neighborhood-based events that provide increased access to art, culture, and creativity. Through community, artistic, and media collaborations, this festival provides experiences in dance, folk and traditional arts, fashion, media arts, spoken-word, poetry, writing, contemporary visual arts, music, opera, theater, design, film and much more. Statewide champions include the Massachusetts Office of Travel & Tourism and the Mass Cultural Council, who also serves as ArtWeek’s Creative Communities sponsor. Additional support comes from the Greater Boston Convention & Visitors Bureau and the Foundation for MetroWest. Lead Media partners include WCVB Channel 5, Entercom, the Improper Bostonian, Boston Metro, Boston Central, Boston Globe, Bay State Banner, Cape Cod Community Media Center and the Massachusetts Convention Center Authority, as well as many others. ArtWeek’s expansion has also been powered by an extensive network of more than 110 creative collaborators at the statewide, regional and community level. To learn more about the festival and its growth, visit www.artweekma.org.